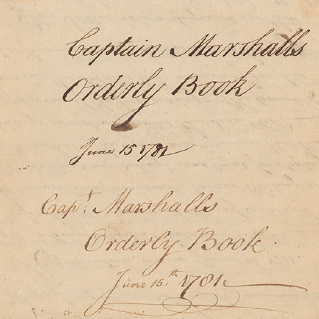 Captain Christopher Marshall Orderly Book, 1781. Society of the Cincinnati Library. It’s been a tougher week than usual chez Calash, what with the AP Euro History and Honors English homework and struggles of the Young Mr, early mornings at work for window installation (finally, thank you!) and a round (lost) with an Orange Line Special virus brought home by Mr S. The bright note came in the mail, though, and thank you USPS for your really reliable and right on (this) time delivery! I have been working to get this book from the Society of the Cincinnati Library on behalf, and at the behest, of the 10th Massachusetts. The SoC have an pretty amazing collection, and they undertook a project to have their entire collection of British and Continental Orderly books conserved. These are incredibly fragile and almost ephemeral books: they’re the daily record of orders, courts martial, movements, complaints and requests for a regiment. It’s like the notes you might keep if you had to meet with your boss and other direct reports every day and keep track of many orders affecting the several hundred unruly, hungry, and possibly irritable guys under your command. But you’re taking notes with quill and ink, in longhand, and no one is going to email minutes out later that afternoon. Bridget Connor turned up in an orderly book, so they can have a novelistic appeal (handy for those of us who approach military history from the social history world). So far, this book has produced no Bridgets, but it has not disappointed. Reader, I wept. The disadvantage and difficulties which from inevitable Circumstances we labour under instead of depressing should inspirit us to surmount them. That we are involved in them is only our misfortune; not to make efforts to Conquer them will be our fault: and if we cannot be so well prepared as we ought at least let us be as much so as we can. There are sketches of the “disposition of the New hampshire Massachusetts Rhode Island and Connecticut lines.” And, as I read to the Young Mr, there is unfinished business in nasty rooms. Some part of the Camp and about the long Barracks in particular is relaxing into nastiness. Regimental QuarterMasters have been ordered to have them Clean and keep them so. An Officer of each Company has been ordered to visit the Barracks every day and to Confine & Report those who throw bones of meat Pot Liquor or filth of any kind near the Barracks. Yet all this has been done and no report has been made. it is hatefull to General Howe to Reitterate orders as it ought to be shamefull those who make it necessary. Why, the Young Mr and I just had a similar talk last night…though, thankfully, there were no bones of meat involved. This going to be a good read. I know the SoC has a beautiful library and nice website, but folks, if you are into this history, throw them some love. I checked their 990s and they’re struggling just like everyone else. And if not them, please, support your favorite local historical site, organization, museum, whatever. Every place has something magical that will change your day. Your money– even a small donation– helps them do that work.